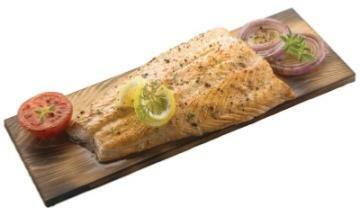 Red cedar plank cooking was discovered by Canadian Pacific Northwest Aboriginals many years ago. 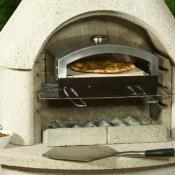 A super way of smoking your fish and you don't need a lid on your barbecue. 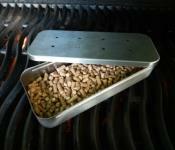 The planks can be used 4 or 5 times if you look after them and they don't char to badly. Just soak the cedar plank in water for about an hour and then lay the seasoned rainbow trout onto the plank. 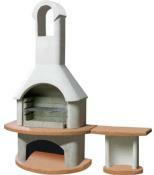 Barbecue using the direct or indirect method. 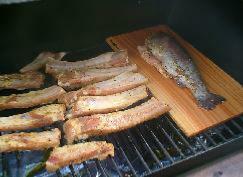 The moisture from the wood is released in a smokey aroma and flavours the fish. 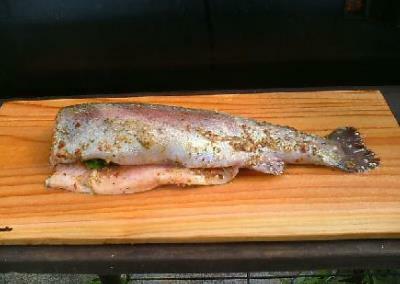 Most types of fish are suitable for plank cooking. Fresh fish always gives the best results. Salmon and Tuna are delicious. 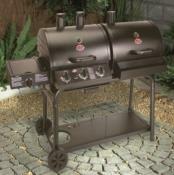 Barbecuing with grilling planks and pork ribs for the main course, see photo above.